Trained at the Rose Bruford College of Speech and Drama in London, Shazia works full time as a writer, actor and stand up comedian. Shazia began stand up comedy in September 2000 and has in a very short space of time worked her way up the ladder picking up along the 2001 Hackney Empire Best New Act competition at the London Comedy Festival part of the prize was to appear at The Palladium. This year Shazia followed this up by winning Metro Magazine’s People’s Choice Best Comic Award at the London Comedy Festival 2002. Shazia’s distinctive act combines a deadpan delivery with observation on her world. Shazia is in certain respects a revolutionary figure being the UK’s only female Muslim stand up, a job which many in her culture would frown upon. This enables her to have a unique perspective as a British Muslim with her material crossing both cultures. Supported by many in her culture Shazia has recently won the award of Young Achiever Of The Year at the Government’s initiative for the Asian community, The Leadership & Diversity Awards. Shazia is in huge international demand with coverage from press, TV and radio in Germany, Denmark, Italy, Sweden, USA, Canada, France, UK and Ireland. 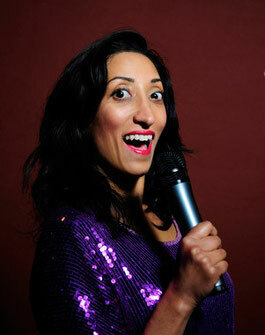 To date, Shazia has performed stand up in Belgium, Holland and Denmark. Shazia has recently appeared on Have I got News For You, Joan Bakewell’s Taboo, Richard & Judy whilst BBC 2’s First Sight made a half hour documentary. Internationally Oprah’s Oxygen Media have filmed a profile on her. Earlier in the year Shazia was invited to perform at the Royal Albert Hall V Day event. Eve Ensler asked her to write her own monologue which she duly did receiving a standing ovation from the cast which included Isabella Rossellini, Maureen Lipman, Rita Tushingham, Meera Syal, Dannii Minogue and Anita Dobson. Shazia can be seen on BBC 1, 11.35pm on Wed 6 November presenting 10 Things You Always Wanted To Know About Islam (But Were Afraid To Ask). Shazia is a practising Muslim.